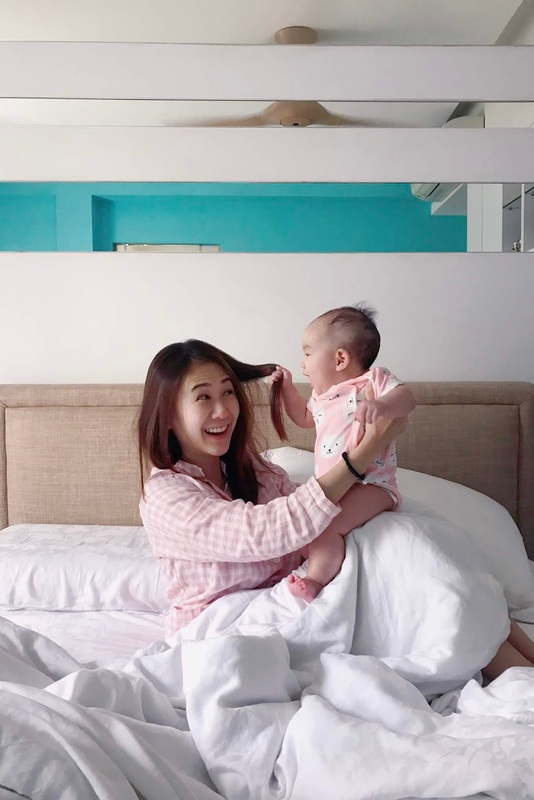 Home Advertorial baby beauty Reviews Combating post-partum hair loss with PHS HAIRSCIENCE®. Combating post-partum hair loss with PHS HAIRSCIENCE®. I always joke that my hair is falling because Arielle loves pulling them now but I know it's not that simple. It's the dreadful Postpartum hair loss. It's horrible and all mommies will agree. So many of you have Instagram messaged me about it, if I face it too, if I have any advice and what hair care am I using. Mine started around July when Arielle was 4 months old. And after 2 months of using this particular haircare brand and almost finishing my second set, I am more than ready to share my review. 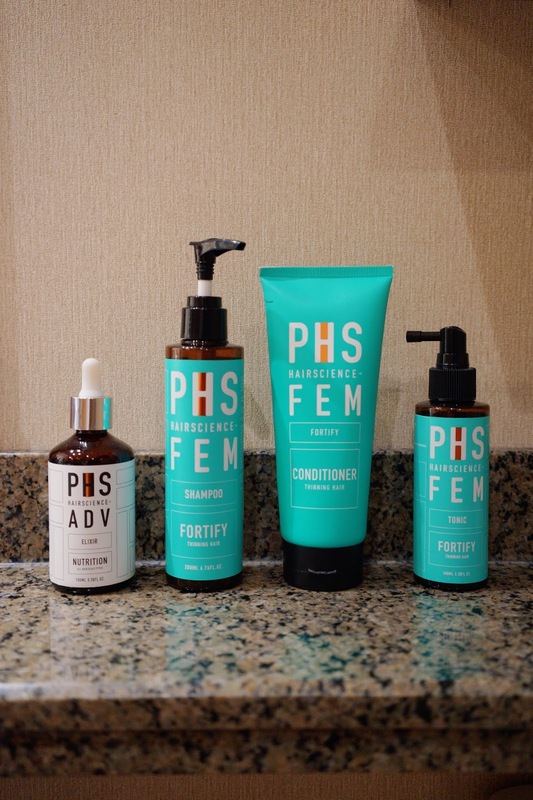 I've been on my second set of PHS HAIRSCIENCE FEM Fortify series since July. To be very honest with you, I only started using mine a month after receiving a set. And it was because my sister, Zonia, gave me good reviews. She went to PHS HAIRSCIENCE for a detailed Hair & Scalp analysis with their trichologist-trained experts. 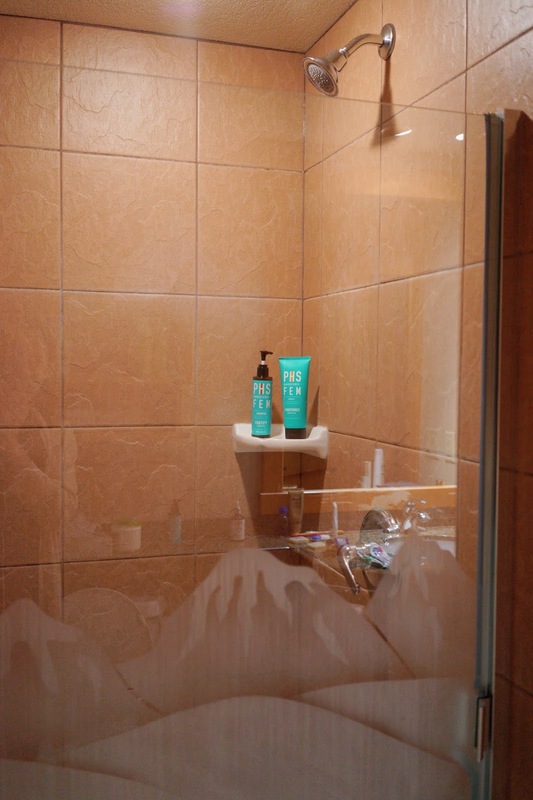 She bought some products and saw very significant results- lesser hair loss on the floor of the shower room. And here I am now, on my second set, using it very religiously every day to combat postpartum hair loss. I even brought the whole set to Canada with me! In my haircare toiletries bag in my luggage! Here are the significant before and after hair results after using PHS HAIRSCIENCE FEM Fortify Series for 2 months. I remember waking up to a pillow of hair. 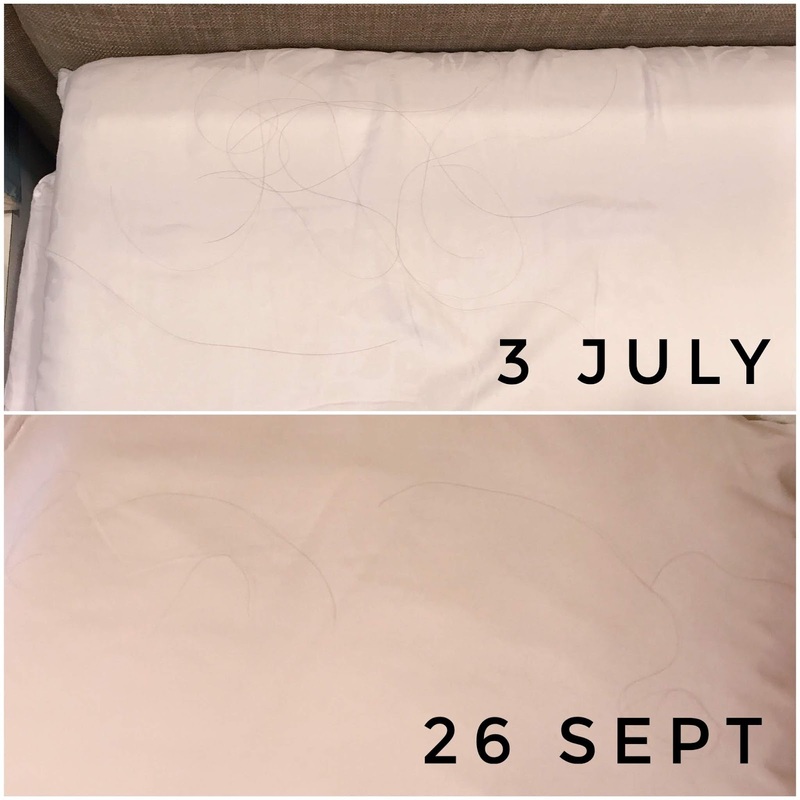 That really woke me up (literally) and I knew I have to use my haircare very religiously if I do not want to see a pillow of hair again. A day later, I took this picture in my toilet to send it to Zonia. 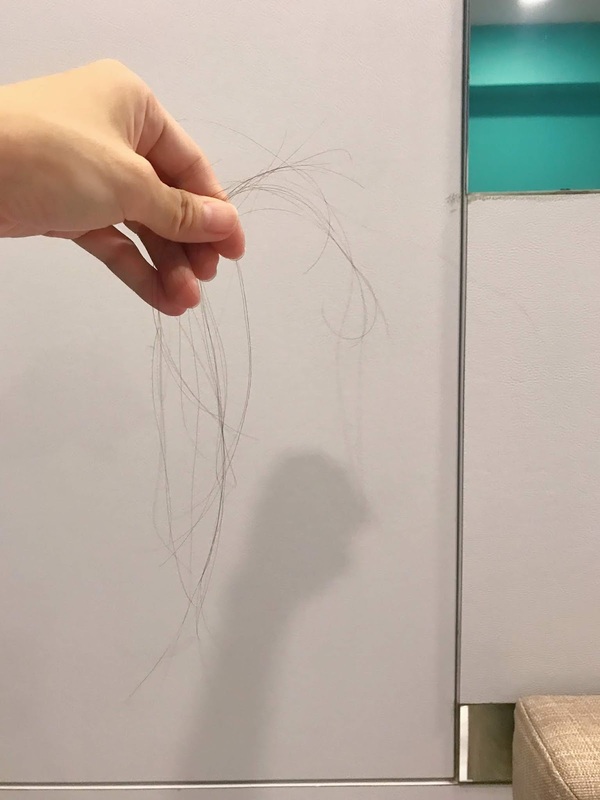 I was so upset, I always see hair on the floor after I washed or blow dry my hair (normal to drop 100 strands of hair every day) but it has never been this bad! PHS HAIRSCIENCE is an award-winning brand offering innovative hair and scalp care solutions backed by science. Created with cutting-edge technology and harnessing the power of the purest botanical stem cells, They have products suitable for all hair and scalp conditions, including oily scalp, dandruff, or even damaged and coloured hair! Here's the 4 steps that I've embarked on, to combat against hair loss. I have not used something like this before. ADV Elixir is a scalp primer to be used even before shampoo. It exfoliates the scalp and unclogs buildup on follicles, preparing the scalp to absorb essential nutrients from the next products to come! Directions: Use before shampoo on dry scalp. Apply evenly and gently massage using fingertips. Leave on for 10 minutes. I usually wash my face and brush my teeth while I wait and very quickly it's time to wet scalp. Follow with shampoo and rinse. 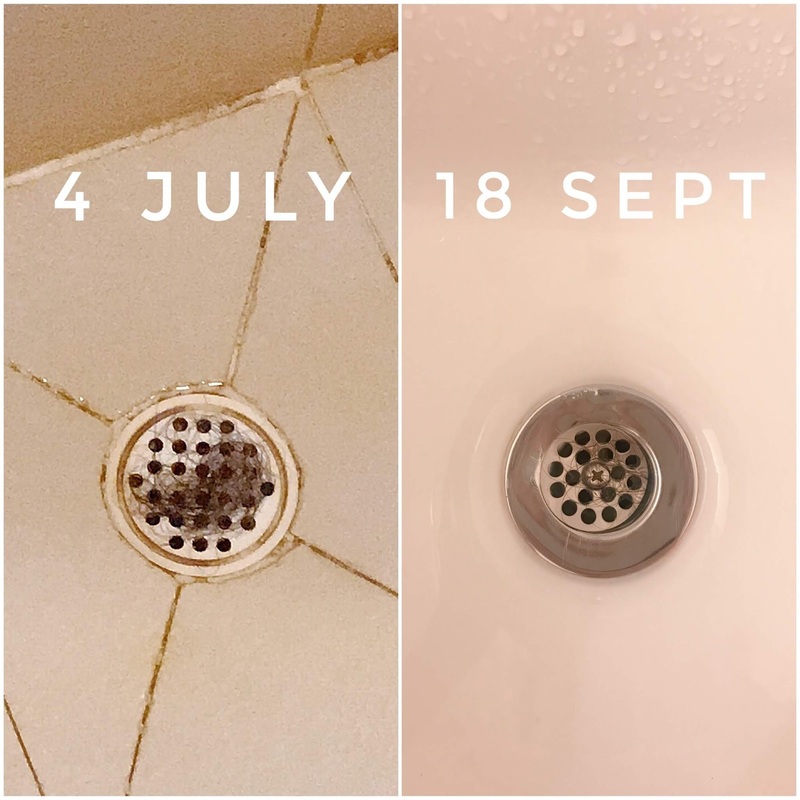 Use up to 3 times a week. Shampoo is very important because this is the one product we would surely have to use, once or sometimes twice a day. You will be happy to know that FEM Fortify Shampoo is specially formulated to combat female hair loss and thinning hair. I have oily scalp and usually by 4pm each day, my hair will be greasy, bad hair makes the whole person looks bad too! Not just appearance is affected, the excess sebum causes pores to clog and this in turn eventually leads to hairfall. The bestselling FEM Fortify Shampoo helps me with all these concerns. Directions: Wet hair and apply shampoo. Gently massage into scalp, working up a creamy lather. Rinse thoroughly. This is not a step I usually take because I do not enjoy being in the shower room for long period of time. But this is an essential step if you want soft hair, isn't it? FEM Fortify Conditioner softens and strengthens hair fibres while restoring shine and vitality at the same time. Directions: Apply conditioner onto damp hair, avoiding the scalp. I like to apply a little more at the hair ends because that's where hair is most dry. After which, leave on for 1-2 minutes and rinse thoroughly. This is my favorite step. I just find tonics extra powerful so this is a step I make sure I never miss! The tonic is water-based, thus neither sticky nor oily. You can use the FEM Fortify Tonic even in the day now before you go to work! It has this botanical, slightly herbal scent which smells really good too. I would usually place focus on my hairline cause that's where hair loss usually happens and the most obvious. Directions: Shake well before use. Section hair and apply tonic on towel-dried scalp. Massage scalp with fingertips. Leave on so I will blow dry hair at this moment. To be used daily. I have been on the Shampoo and Tonic since July but am new to Step 1 (ADV Elixir) and Step 3 (Conditioner), only started using them this Canada trip, which is end September. Results from using just 2 products have been amazing so far so I am excited to see better results now that I am on the full range! FEM Series is not just for mothers who are suffering for post partum hair loss. This series help keep hair follicles in good condition for healthy, normal hair growth. Anyone with hair fall concerns or looking to prevent hair loss can use this series too! Who doesn't want strong, healthy hair? All products contain Korean Botanical Essences, Botanical Stem Cells and does not have any harmful additives. If you are keen to try out any products from PHS HAIRSCIENCE, use code ZOERAYMOND20 for a 20% off on their e-store! You can also pop by any of their stores and flash this blog article to enjoy 20% off, valid for all products except PRO range and all activators. Promotion valid till 31st October 2018 only. 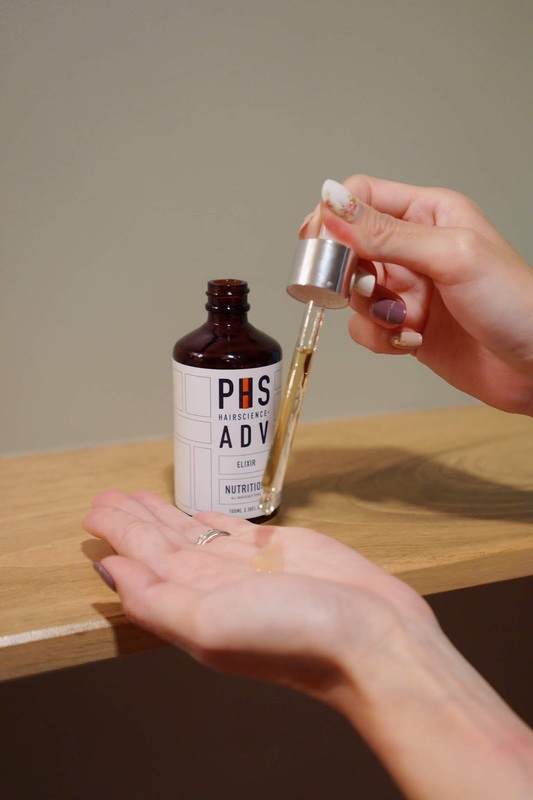 If you are unsure of your hair and scalp condition and looking for tips on better home care and product recommendations, you can book an appointment for a complimentary Hair & Scalp Diagnosis by quoting “Zoe x PHS” too!